In the absence of the injured Tiger Woods, we were served a Masters strikingly abundant in talking points that include but go beyond its extraordinary champion. This was an event we will remember for the guys who came second, for the astonishing power that brought a second Green Jacket for Bubba Watson, for amazing performances by the older generation and for some rather indifferent ones from those at the heart of the UK's golden era. Here's why the 2014 Masters will be remembered for more than Watson's second major and the sixth left-handed Augusta victory in the past 12 years. There was a Tiger-sized hole heading into the Masters from the moment the world number one revealed he was recovering from back surgery. Who would fill the void? The answer was the most exciting American talent we have seen for a generation. At 20, Spieth very nearly replaced Woods as the youngest Masters winner. He showed he has a game for the majors - and most significantly he was annoyed he didn't win. Joint runner-up with Jonas Blixt was not enough for the Texan youngster, who clearly has a fiercely competitive edge. "It stings right now," he said after leaving the 72nd green following as creditable a Masters debut as was imaginable. The third round was one of the most compelling days of major golf in recent times. And the reason was the way Spieth hunted down Watson for a share of the 54-hole lead. There was a discernible buzz among the galleries as they exited the grounds. "Real deal," was the phrase on everyone's lips. Suddenly the world was aware of golf's newest superstar. Spieth is just what the game needs, especially with so much uncertainty surrounding Woods and Phil Mickelson struggling for his best form. Having broken into the world's top 10 before he can legally have a drink to celebrate the fact, Spieth provides a new focal point for the game. A youthful lack of composure - you could see his annoyance as the Masters slipped away - contributed to his defeat but he is sure to learn from it. As was the case with Rory McIlroy in 2011, defeat is probably the best thing that could have happened for Spieth's long-term future. And let's not forget the other rookie who was second. Blixt is nine years older and so falls into a different category of prospect. But the American-based Swede is emerging as one of Europe's top players. Completing all four rounds under par was some feat and he should be a welcome asset to Europe's Ryder Cup effort. It can't be right that you can hit a drive and sand wedge into the par-five 13th, can it? But Watson was astonishing as he cut his unconventional swathe through golf's most celebrated course. The fact is that no-one else in the game can come close to pulling off some of the shots in the big-hitting left-hander's armoury. Take his tee shot to the 240-yard par-three fourth. Only he could summon the towering height that enabled him to land his ball so close to the final-day pin position that was inaccessible to everyone else. Spieth needed to hole a bunker shot to make his birdie while Watson was left with a short putt to keep pace. No conventional technique can create such shots; Watson, with his self-taught method, is a freakish force of nature. Yes, in general, the ball is travelling too far in golf - we've been saying it for years. But Watson's feats shouldn't be the ones to prompt change. Instead, his unorthodox power generation should be celebrated for its proof that there is more than one way to play the game. The exploits of the likes of Miguel Angel Jimenez, Bernhard Langer and Fred Couples lit up the week too. For Jimenez to finish fourth and shoot the lowest round of the week - a 66 on Saturday - is an extraordinary performance at the age of 50. The Spaniard is living proof of the merits of cigars, red wine and middle-aged pony tails. More seriously, his longevity is testament to his dedicated warm-up routines, which promote the flexibility that allows him to continue to compete. Couples and Langer, meanwhile, provide proof that it is possible to coax your way around the modern-day Augusta with guile and local knowledge. Between them they have played 61 Masters and they know their way round better than anyone. Langer's closing 69 matched Watson's final-round score but was achieved in a markedly different manner. Where was the UK challenge? This year saw Rory McIlroy achieve his first Masters top-10 finish - but the Northern Irishman really needs to eliminate that one destructive round that prevents him from challenging for the Green Jacket. This was his fifth successive Masters to include a round of 77 or worse but the two-time major winner undoubtedly has the game for Augusta. Expect McIlroy and Spieth to provide a compelling Augusta rivalry in future years. It didn't quite happen for English pair Lee Westwood and Justin Rose. Westwood is good enough to contend but remains wanting when it is time to press the accelerator on the final day. 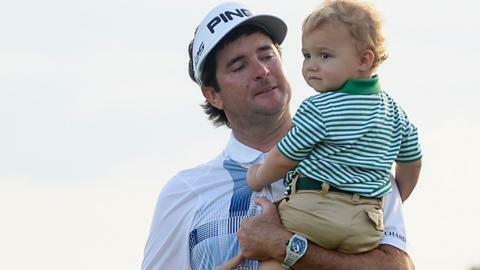 Rose was largely undone by a first-round 76 and deserves credit for battling back. So does Ian Poulter - who followed an opening 76 with two rounds of 70 before slipping back to two over on the final day - but he needs something extra in his game to make the most of his tenacity. The Englishman tweeted afterwards that he will win a Green Jacket one day but he lacks the firepower of a Watson, Adam Scott or Mickelson. It would be a brave bet. So how good was the 2014 Masters? We missed the buzz that Woods brings to every tournament he plays but this was a compelling week. The first two rounds are always a grind. The course is set up that way and then the tournament committee opens the possibility for weekend fireworks. That's exactly what happened. Third-round day began with Gary Woodland going to the turn in 30 while Jimenez surged from the back of the field with his 66. Ultimately it took a wonderfully composed round to win. It came from a special player because Watson is a genuine one-off. It helped make for a fascinating week and the tournament will remain as eagerly anticipated as ever when it comes around next year.